AC separation is a common sports injury, especially with sports like football. Any sport that produces significant amounts of contact can produce a seperated shoulder. A seperated shoulder is the same thing as an AC joint separation, or AC joint sprain. Lets take a closer look at what the AC joint is, how it is injured, and how it is treated. The AC joint, or acromioclavicular joint, is located on the outside of the shoulder. The acromion (part of the scapula, or shoulder blade) and the outside end of the clavicle make up the AC joint. The two bones are connected by ligaments. As you move your arm up over your head, the clavicle rotates at the AC joint, and allows the shoulder to move. There are numerous muscles that attach around the AC joint, including the deltoid, the scalenes, and the upper trapezius. One of the most common causes of an AC sprain is landing on the shoulder. This can happen with any sports that involve contact, like football, or with any sport that you may fall while playing. Direct contact of the tip of the shoulder with the ground produces significant force on the AC joint, and can lead to injury. In addition to falling on the shoulder, you can also suffer an seperated shoulder by falling on an outstretched arm, which transfers force up into the AC joint, or by a direct blow to the tip of the shoulder. An AC separation is a joint sprain, and all joint sprains are graded the same way to determine severity. The grade is dependent upon how much laxity or looseness is present within the joint. Grade I sprains have very litte laxity, whereas Grade III sprains involve an almost complete rupture of the ligament. 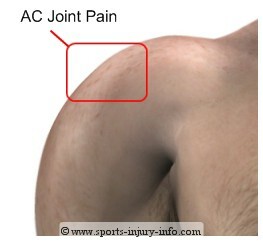 Pain is the most common symptom of AC joint injury. Following a direct blow or landing on the shoulder, you may experience pain along the tip of the shoulder. 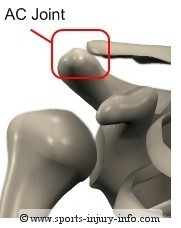 There may be obvious deformity of the AC joint, where you can see the separation of the clavicle and the acromion. This is called a "step off" deformity. The amount of deformity is dependent upon the severity of the sprain. Grade I sprains usually do not have any deformity, where grade III sprains may have a significant amount of deformity. Other symptoms of an AC sprain include swelling over the AC joint, loss of range of motion in the shoulder, and possible loss of strength. Depending on the severity of the injury, you may have to wear a sling for several weeks. The goal of treatment in the initial stages is to protect the healing tissue, and to control your pain. A sling will help to reduce the stress on the AC joint while it heals. 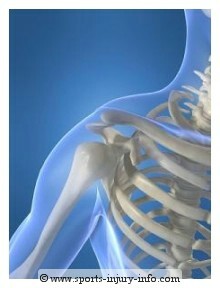 Surgical intervention is not usually considered for shoulder separations, as conservative treatment is usually enough. R.I.C.E. 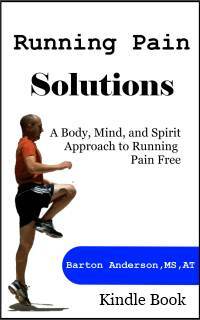 Principles in the initial days following injury will help to control swelling and pain. If you think that you may have suffered an AC separation, you should see your athletic trainer or physician for evaluation. An AC separation or seperated shoulder is a common sports injury. It can be caused by a direct blow or fall on the shoulder, and can limit your range of motion. You may have to wear a sling for several weeks while it heals, but surgery is generally not required.